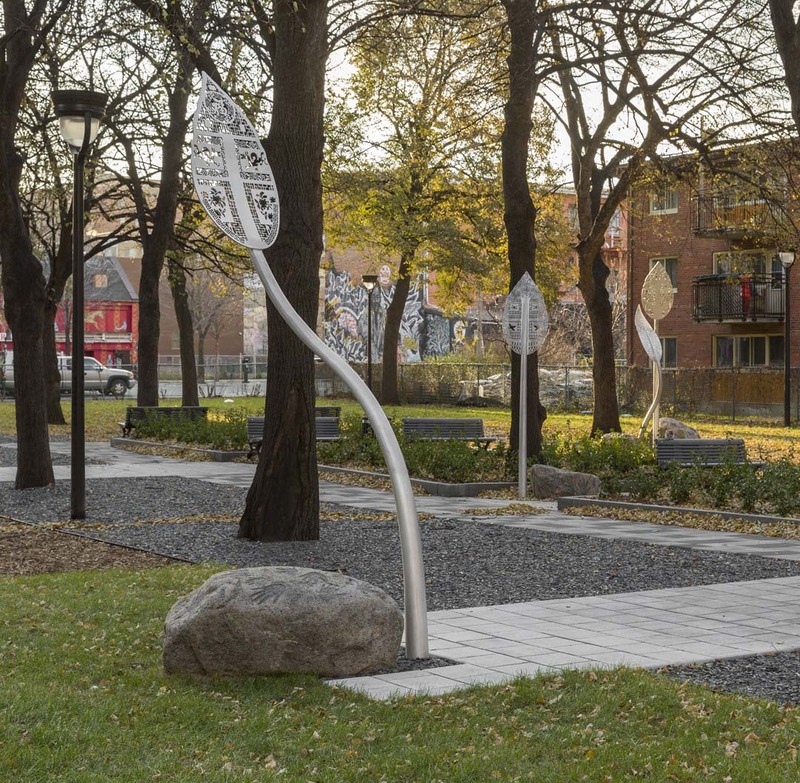 Installed in the south section of Parc Toussaint-Louverture, L’étreinte is a sculptural grouping formed of six small islands produced in close collaboration with the residents of Habitations Jeanne-Mance, in the context of a cultural mediation project. Each small island is made of one or two granite boulders that have been polished and rounded. 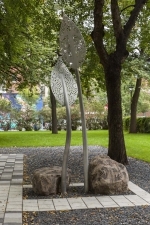 From the boulders emerge long stems at the end of which are one or two tree leaves made of aluminum, pierced with abstract motifs. The artist gathered these motifs from residents from different communities living in Habitations Jeanne-Mance, inspired by artisanal ornamentation in these residents’ countries of origin. The eight granite boulders that form the bases for the leaves bear the indented imprints of the hands of 30 children. In the palm of each hand is a child’s name. Around them, engraved sentences express wishes for future generations. 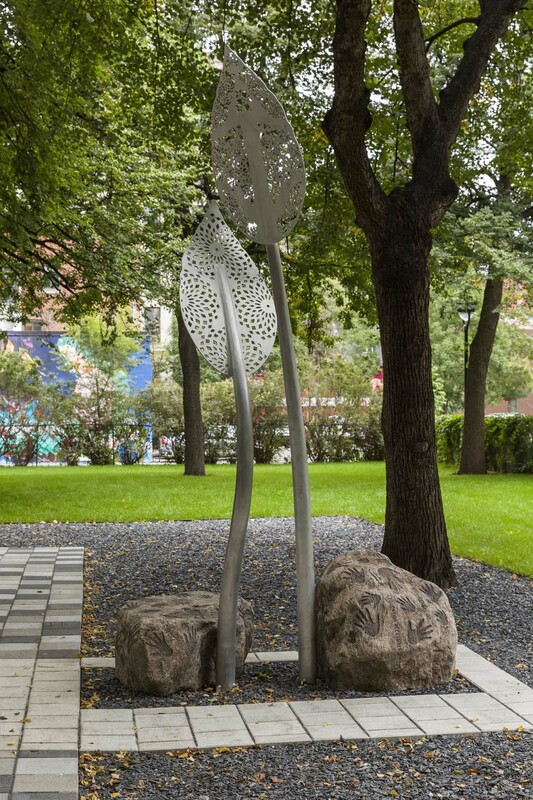 The metal leaves that emerge from the boulders symbolize the strength of nature. Their designs evoke cultural diversity and the residents’ respective handicrafts traditions. The granite boulders covered with children’s hands, names, and wishes, become a welcoming host. Born in Sainte-Luce in 1964, Luce Pelletier lives and works in Québec City. She holds a master’s degree in art history and art practice from the Université du Québec à Montréal and teaches at the Maison des métiers d’art de Québec. In her production of ephemeral artworks in nature and permanent sculptures in the public space, Pelletier is interested in the relationship between humans and their environment. 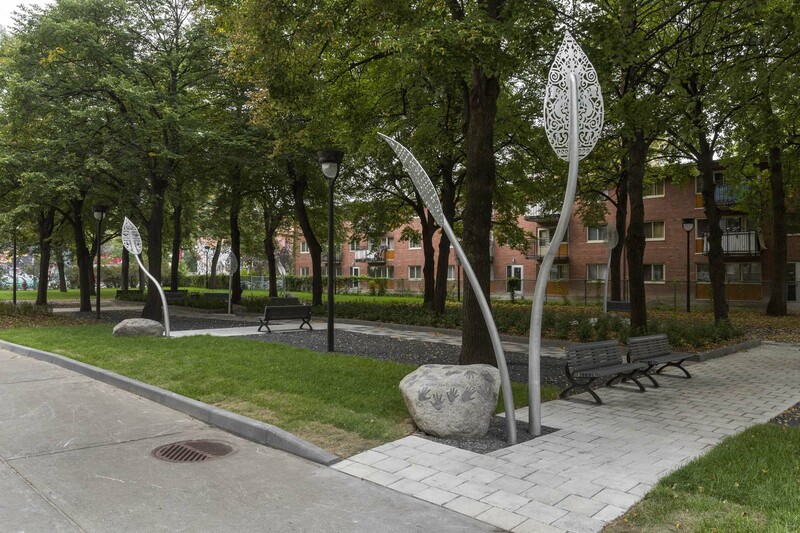 She has produced almost 20 works of public art in Québec. Aluminum: cut out, bends; welded and assembled. Granite: Sandblast engraving.